[New for early 2017] I got a kick out of doing back to back pb fudge reviews so let's try to do it again. 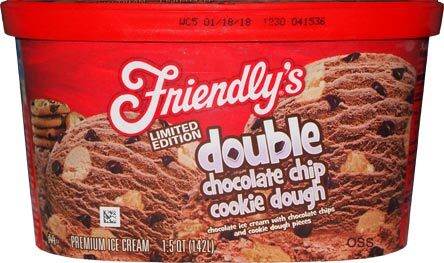 As you may remember, I've taken a break from Friendly's quarts for the last year due to their nonsense in the texture/density department. Well, I decided to give them a chance because I had to know what was in this pint. Will I regret my decision? There's lots of little chocolate chips to get us started. They are so cute when they look like little morsels, it's a shame they aren't that easy to eat. They kind of get lost in the quick melting ice cream... but then they kind of come back to haunt you as your teeth slam down on their tinyness. 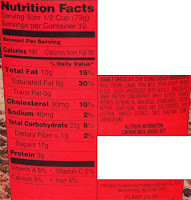 At least the base has a really good milk chocolate flavoring. That is easily the high point here and it's what kept me going through several servings. The cookie dough looks very bland (or floury) doesn't it? I take a lone bite and it's actually pretty good but when I eat the dough with any ice cream, it quickly loses that little pop. I really do like the flavoring of the base. It's dialed in perfectly. I was going to mock the aftertaste as I sit here reflecting on my snack, but then it dawned on me. The flavor in general and the aftertaste in particular remind me of a frozen Jell-o pudding pop. Even the consistency of the way it breaks down is reminiscent of that pudding pop. Ha. It's both mildly disturbing yet tastefully nostalgic. Ok, I'm going to let my family dig in to this one and see if more cookie dough bits pop up. On Second Scoop: Well, I think the picture pretty much confirms my first scooping sarcasm about this being "double chocolate chip" cookie dough ice cream. Ugggg. Way to squander an awesome name Friendlys. 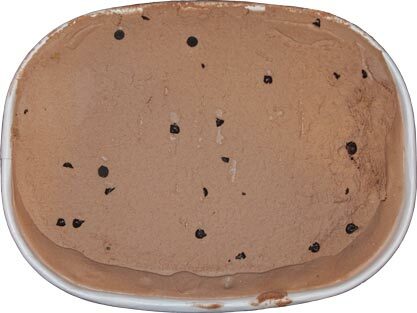 Even with a lack of cookie dough, I can see the tiny chocolate chips annoying some people more than an ice cream should. That said, I still think the base has a nice flavor despite my daughter giving this one an overall "meh" rating. On a positive note, I'm glad it's not a fdd! I can definitely see the letdown. 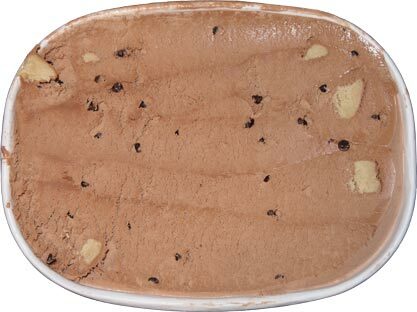 I wish more companies would come out with Cookie Dough ice creams with a non-vanilla base. I saw this product last night and took a pic to send you hoping I had beat you to seeing it! Ha, but then I saw this. I don't love the friendlys regular chocolate. I prefer forbidden chocolate. 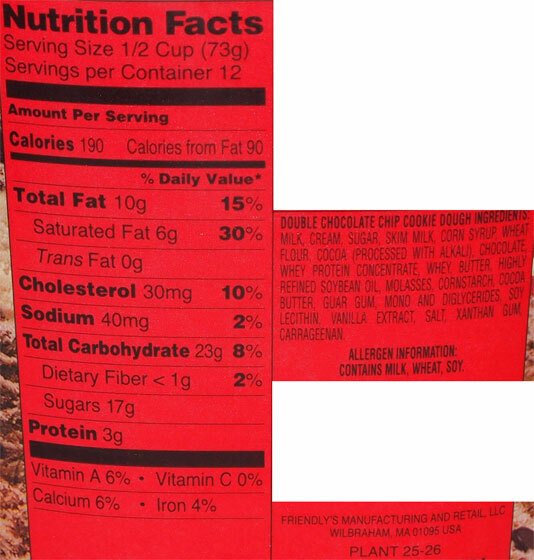 I do love Choco chips over cookie dough so I bet I'd like that part. But I'm not super interested although I like the concept. I just discovered this. 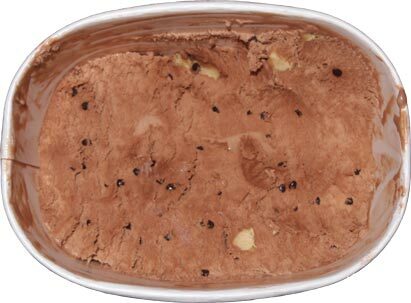 I've been waiting for someone to make a chocolate based ice cream with cookie dough. It's not perfect but it's exactly what I've been waiting for for probably 20 years. I'm upset it's limited edition and that I can't find it anymore.